John-Michael Albert was appointed the 8th Poet Laureate of Portsmouth for two years from April 2011 to April 13. Mike was born into a German farming family in southwestern Ohio. He spent most of his childhood in and around Dayton, Ohio. At 16, he moved to Houston, Texas. Thirty years later, he moved to the Seacoast area of New Hampshire on Groundhog Day in 1999. He is a published composer (Yelton Rhodes Music), with a BA in music from The University of the South (1980, Sewanee TN) and 15 years of experience composing for and conducting the Gay Men’s Chorus of Houston (1981-1995). On moving to New Hampshire, he changed the artistic direction of his life and dived into the thriving Seacoast poetry community. 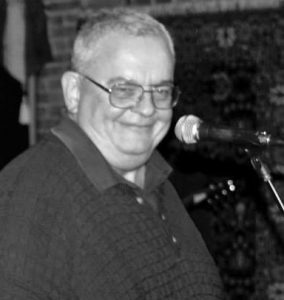 He has been a member of the board of the Poetry Society of New Hampshire and Jazzmouth: The Portsmouth Poetry and Jazz Festival and was a founding member of the poetry workshop and performance ensemble, Blood on the Floor. In addition to frequent invitations to read his work in public, he has hosted many monthly poetry readings, judged poetry contests, edited poetry anthologies, and written over twenty essays on the craft of modern poetry for publication (see, for example, Animus, the poetry quarterly from Sheltering Pines Press). He is the editor of both The 2008 and The 2010 Poets’ Guide to New Hampshire, a 2-volume anthology of 400 poems about his new home state by 300 poets, culled from the last two centuries. He is the author of Two-Ply and Extra Sensitive, collected published poems 2000-2006 (Sheltering Pines Press, 2007); Apple Blossoms, Splinters and Flames, peace poems (Sargent Press, 2008); Oh, Ethel! Did You See That?, humorous poetry (Sargent Press, 2008); Vivaldi for Breakfast, collected published poems 2005-2009 (Moon Pie Press, 2009); Cardamom Cravings, notes for an autobiography (Sargent Press, 2012; 2nd edition, Marble Kite Press, 2017); The Bird Catcher, new and selected poems (Moon Pie Press, 2012); The Light and Air of Our Work, essays, reviews, and poems about poetry (Marble Kite Press, 2013); Portsmouth and Star Island Poems (Marble Kite Press, 2016); The Reporter’s War, opera libretto (2014) and comments (2017), (Marble Kite Press, 2017); Questions You Were Too Polite to Ask, selected poems 2011-2017. His latest book is The Light and Air of Our Work: Essays, Reviews, and Poems about Poetry (Marble Kite Press, 2013). His project, Ambushed by Poetry aimed to assert poetry into people’s everyday experience of the city of Portsmouth. In the project, excerpts from poems were placed on buildings near Portsmouth’s Market Square. People used QR codes and clues from social media accounts to seek out the excerpts, with the goal of providing an interactive poetry experience. You can learn more from the project’s Youtube Page or Facebook Group. Or read more about John-Michael Albert and his work by visiting his website. The Brick Project continues to have a great deal of success. Mike Nelson filmed John-Mike Albert reading 40 of the Brick Project poems throughout the city of Portsmouth. The films were each posted to YouTube. Eight years later, the poems have been viewed a total of nearly 17,000 times.